Go to My Account page by clicking Library Account -> My Account from the upper-right corner of the Library web page. If you are not already logged in, the system will prompt you to log in before you can access the My Account page. Log in with the barcode number at the back of your matric card, and PIN that have been registered. How can I retrieve or reset my PIN? You can retrieve/reset your PIN at the Circulation Counter in any of our main branch (PSZ JB, PRZS or PSZ KL). Our staff on-duty will be available to assist you. I would like to extend the due dates of books borrowed, how can I renew them online? 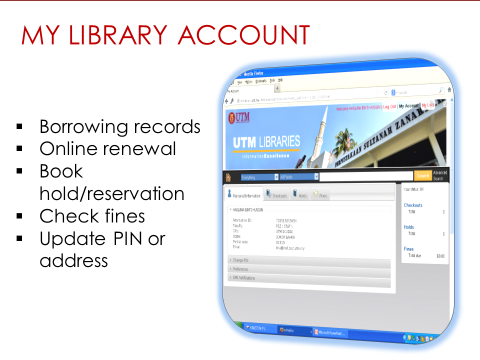 You have to log in to My Accounts to renew your loans online.Each successful renewal will extend the due date or period by your normal loan period (e.g. 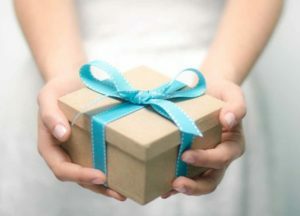 14 days for undergraduate) from the day you renewed the item. E.g. Today is Oct 1, if you successfully renew the item on Oct 1 and an undergraduate, the new due date will be Oct 15. Renewals are free. 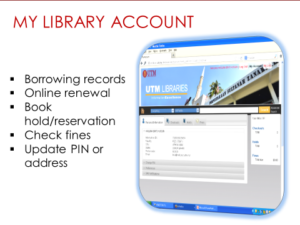 To borrow items from UTM Library, bring them to self-checkout machines where you can check out the books using your Matric/Library card.In addition, you renew the loan TWICE, as long as there is no request for the book from other user. Renewal can be made online, under My Accounts. Make sure to have your Matric/Library card and PIN ready.For more information, please visit the Library’s website. You can reserve the item online using My Accounts.